It's February and it's time to get back to my Fulfillment Project. Remember, the one based on Gretchen Rubin's Happiness Project where I try to make my pretty good life better. The other night we had family movie night. There was a bit of a tussle about what to watch but we finally settled on Mr. Popper's Penguins. And even though I hated the book (I know, I know, the rest of you loved it, there's something wrong with me) I LOVED this movie. In fact, not being a fan of the book or Jim Carrey, it took me by surprise how much I loved this movie. Child #1 and I laughed so hard we almost fell off the couch, which was perfect for the laugh more part of my project. After the movie was over the kids asked the standard question. "Mom, if you had to choose, which penguin would you be?" "That's easy," I said. "I'd be Lovey Penguin." And it was easy at that moment when we were all snuggled up under a blanket. The next morning Child #2 decided to pretend to be Loudy Penguin. He came to my side of the bed before the sun was up and squawked, LOUDLY in my ear, which is the point, I guess, of being Loudy Penguin. My regular readers know I'm, well, not what you'd call a morning person. My reaction to Child #2's Loudy Penguin impression was not in character with Lovey Penguin. 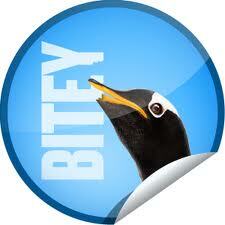 In fact, for the next hour and a half I was definitely Bitey Penguin. As I stopped to think about it I realized that, even though I like to say I'm Lovey Penguin, the sad truth is more often than not, I'm Bitey. And here we are, in February, the month known for hearts, cupids and Lovey Penguins. I've decided this will be my month to make an effort to be less Bitey and more Lovey. It will be difficult. This is something I know for sure. Juggling homework, piano, swimming, choir, writing, chess club, book club, social networking, playdates, Girl Scouts, Cub Scouts and a second book on the way is enough to make anyone Bitey. Be that as it may, I'm striving for Lovey! And I've got a plan. Stop by on Friday to read about phase one of Operation Lovey Penguin. Family Movie night is always fun. We try to do that every Friday. We rented Commando last week and were in hysterics as to how absurd and hard to believe the storlyline and fight scenes were. I do like Jim Carrey and glad to hear this one was good. lol about Operation Lovey Penguin, I love it! teehee--I am not a Jim Carrey fan, either, but I really wanted to see this. And I can totally see why the movie might work better than the book--penguins are just SO CUTE but getting that across in words misses it. Don't worry, I would've been bitey as well! Naida, never heard of Commando will have to check it out. Hart, maybe that's why it worked better! Angela, not so terrible. I think all the moms in the room get it. Alex, good! Glad to know I'm not alone. I'm definitely more Bitey than Lovey. Funny enough, I'm trying to be less so, as well. And a double HERE HERE on the not a morning person issue. 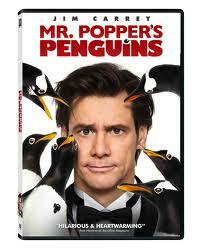 I now want to see "Mr. Popper's Penguins." Johanna, I didn't like the book either, and I really had no interest in seeing the movie because of it. Good to know it might be worth a look! What a cute post. I never would have thought this movie would be any good, but I'm glad to hear you enjoyed it so much. Dianne, I was completely prepared to read a book and pretend I was watching. The movie caught me off guard. lol... we just watched this last weekend. We saw it in the theatre when it came out, nad the kids just loved it. I <3 Jim Carrey, and this was a much more reserved role for him. He's got some decent acting skills.